Follow the Brea Police Department on Twitter, Facebook and Instagram! Do You Have Urgent Mental Health Questions? By dialing 2-1-1, you reach a free, 24-hour information and referral helpline linking you to thousands of local health and human service programs in Orange County, CA. Staffed 24 hours per day by caring, experienced and trained specialists, and available anytime through their online resource database http://211oc.org. Who Qualifies for a '5150' Hold? When a person, as a result of a mental disorder, is a danger to himself/herself or others or is gravely disabled, an officer may take the person into custody and place him or her in a facility for a 72-hour treatment and evaluation. As always, dial 9-1-1 in case of an emergency or if you, your loved one and/or the public are facing an imminent threat. Summer is peak season for grilling, but also prime time for grill related accidents, injuries and fires. Stay safe this summer with these tips. Keep your grill at least 10 feet away from your house - the farther is better. This includes portions attached to your house like carports, garages and porches. DO NOT use underneath wooden overhangs. The fire could flare up into the structure above whether it's charcoal or gas grills. Clean your grill regularly. If you allow grease and fat to build up, they provide more fuel for a fire. Always check for gas leaks. Using a solution of half liquid dish soap and half water you can make sure no gas is leaking from your grill. Rub the solution on your hoses and connections then, turn the gas on. While checking, ensure that the grill lid is open. If the soap forms large bubbles, that's a sign that the hoses have tiny holes or that the connections are not tight enough. Keep decorations away from your grill - they do nothing but provide fuel for a fire. Keep a fire extinguisher within arms distance while grilling. If you don't know how to use it, don't waste time trying to figure it out - just dial 911 and let the fire department do their job. NEVER turn on the gas while your grill lid is closed. It can cause gas to build up inside your grill and when you do light it, it can explode in your face. Do NOT Leave a grill unattended. Plan ahead and finish other food prep chores so you can focus on grilling. DON'T Overload your grill with food - fatty meats and too much fat drips on the flames at once, it can cause a large flare-up. NEVER Use a grill indoors, even a small one. 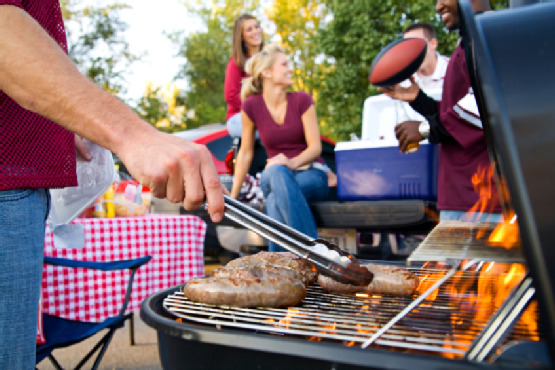 Not only is it a fire hazard, but grills release carbon monoxide, the deadly colorless, odorless gas. Awareness – Constantly be aware of your surroundings. It does not matter where you are, at home, out shopping, driving, at the park, DO NOT settle and become so involved in your task that you fail to look around. This is when you are at your most vulnerable. Take a minute, scan the area before you head out. Take a look around – Look around and see what potential threats may be looming. Are there suspicious people parked by your car? Is there a car approaching slowly from behind or following you on your run? If you see something that makes you suspicious or uncomfortable, walk away, return to the store, and report the activity. If you SEE something SAY something. You can reach us at our non-emergency line at (714) 990-7911. Consider the Stakes - Property can be replaced, but you can't. If you are in fear for your safety, give up the purse, the wallet or car. Your personal well-being is much more valuable than your property. Don't be a Target – While out and about constantly survey your surroundings. Simple things like carrying your keys and whistle in your hand (not buried in your purse) or ensuring your purse is tucked under your shoulder (not dangling down or sitting unattended in a cart) can prevent a crime from happening in the first place. Be a Good Witness - If you see or are a victim of a crime, be the best witness you can be! Without good suspect descriptions it is difficult for police to conduct follow-up and apprehend criminals. While it may be difficult during the crime, try to pay attention to basic physical descriptions such as hair color, height, weight and build, clothing color, suspect vehicle description and license plate, direction of travel. Rare or very specific descriptions are even better – things like tattoos, scars, and piercings or damage on a suspect vehicle.